Posted June 17, 2015 by Dr. William Myers & filed under General Dental Articles. Now that summer is officially here, we’re all starting to plan those well-deserved vacations or long weekends away. Naturally, you also need to pack. So you load up on clothes, snacks, medications, and everything you may possibly need. Yet you forget your toothbrush. What do you do when you’ve reached your destination and it’s time to brush those pearly whites? Take some advice from my dental office in Warsaw. Even if you’re without a toothbrush, you should still do something to rid your mouth of the bacteria that accumulates over time and after meals. But how? With a paper towel! A clean, sturdy paper towel can go a long way toward getting your teeth clean until you have a chance to get to the store and buy another toothbrush. Simply find the thickest paper towel you can, wet it, dab on some toothpaste, and wrap it around your finger. Place your towel-wrapped finger along the gum line and gently scrub outwards. Then follow the same technique on the backs and chewing surfaces of each individual tooth. Don’t forget about the tongue! Scrub it as best as you can. When you’re done, rinse well. If you forget both a toothbrush and toothpaste, this tip is for you. Start by washing your hands with soap and warm water, but don’t dry them. While fingers are still wet, take your index finger and begin to scrub it over each individual tooth, the backs, and chewing surfaces. If a paper towel or soft wash cloth is handy, wet it and follow up your finger cleaning with a gentle brush of the cloth. Rinse, swish, spit, and repeat if necessary. 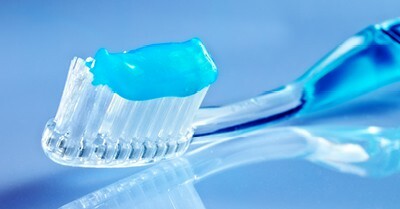 If you have no toothbrush and no toothpaste, but have some handy ingredients, you can make your own temporary paste to use with the above tip. All it takes is some water, salt, or baking soda. One or two teaspoons of salt or baking soda dissolved into warm water act as a gentle abrasive for your teeth, and can be an adequate replacement to toothpaste if needed. This summer, or any time you’re away from home and find yourself without a toothbrush or toothpaste, follow the tips above. While these aren’t long-term solutions and a proper toothbrush and toothpaste should be found as soon as possible, they can go a long way in getting dangerous bacteria off your teeth. And as always, keeping up with appointments at my dental office in Warsaw are crucial to maintaining a healthy smile for a lifetime.